Life expectancy gives a profound and comprehensive picture of a nation's progress and challenges. Higher life expectancy are in many ways a pre-requisite for optimizing a nation's human resource, health and alleviating the masses from poverty. Although genetics do play a small role, studies show a direct correlation between higher life expectancy and a nation's economy. Nations with the highest life expectancy also have developed economies. According to the latest World Health Organization (WHO) figures, Ethiopia's life expectancy average has slowly climbed to 54. The data taken from Ethiopia shows Ethiopian women have an average life expectancy of 56, while their male counterparts have a 53 year average. Moreover, WHO data reveals Africa's life expectancy has climbed to a 54 year average, well behind the global average of 68. Aside from poverty, the biggest factor to much of Africa's low numbers is infant child mortality rates being very high, along with HIV/AIDs being a major problem in many countries. Locally, Djibouti, Sudan, and Eritrea have all seen their life expectancy climb at a faster pace, particularly with Eritrea, which continues to lead mainland Sub-Sahara Africa with a 66-year-average expectancy. 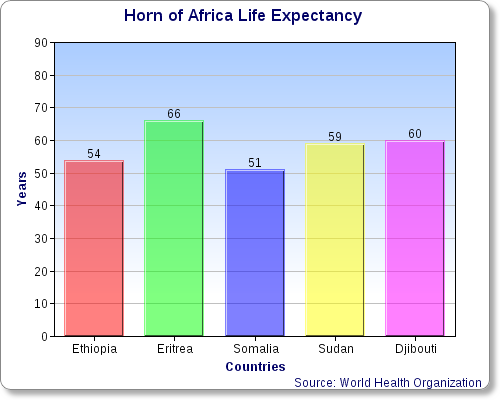 Life Expectancy Chart for Ethiopia, Somalia, Djibouti, Eritrea and the Sudan.